Members of Rivers State HIV/AIDS DRM TWG, HFG staff and the leadership of Cool/Wazobia FM/Nigeria Info Radio Station Rivers state, after the signing. In Nigeria, private organizations, including the media, are heeding the call to take ownership of the HIV and AIDS response. 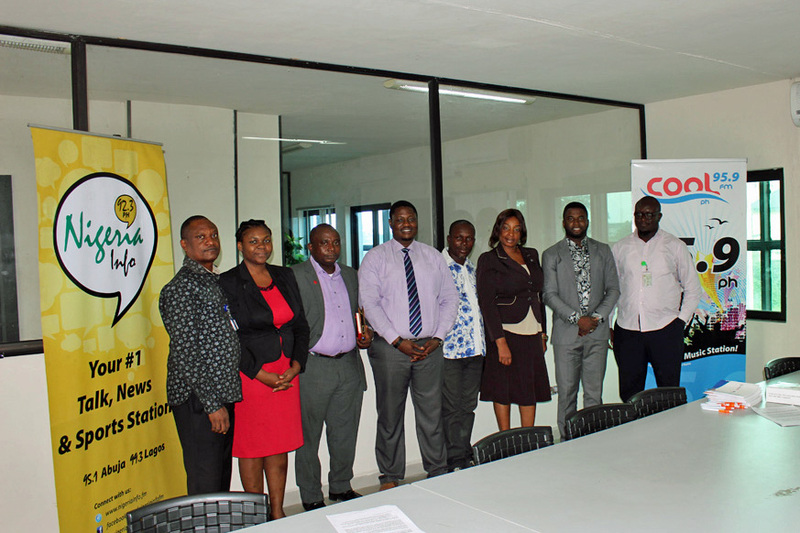 Rivers state radio station Cool/Wazobia FM/Nigeria Info has shown commitment to the cause, signing a deal in July 2016 to provide HIV-related programming over the next two years. The memorandum of understanding—worth over 19 million Naira (about USD $48,000)—was developed in partnership with the Rivers State HIV/AIDS Domestic Resource Mobilization Technical Working Group (DRM TWG). Cool/Wazobia FM/Nigeria Info reaches over 15 million listeners across Rivers state and southern Nigeria through three distinct channels: Cool FM targets youth with music and entertainment; Wazobia FM provides local content mainly in pidgin English; and Nigeria Info targets the general public with news and current affairs. Supported by USAID’s Health Finance and Governance (HFG) project, the Rivers State DRM TWG is one of several activities in Rivers and three other states that are part of efforts geared toward stimulating domestic financing for Nigeria’s HIV and AIDS response. The TWG was created as a forum for cross-stakeholder collaboration to promote local funding for HIV and AIDS programs in the state, encourage public-private partnerships, and ensure efficient and effective use and management of both public and private funds for HIV and AIDS programs. The TWG is comprised of representatives from civil society organizations, the private sector, state government, donors, implementing partners, and the media. The media partnership between the DRM TWG and Cool/Wazobia FM/Nigeria Info will build awareness and strengthen advocacy for increased domestic resources for HIV and AIDS, including orphans and vulnerable children. The hope is that this partnership will encourage other private sector partners to engage in the cause. “This is a very important development in this part of the world and a dawn of the new era,” said Dr. Gafar Alawode, HFG’s chief of party in Nigeria. Interviews with stakeholders, members of the Rivers State AIDS Control Agency (RIVSACA), and members of the DRM TWG, to be aired monthly on Cool/Wazobia FM and quarterly on Nigeria Info. Mr. Tomi Bolade (right), Cool/Wazobia FM/Nigeria Info presents the signed document to Mr. Stanley Wowo (left), RIVSACA, and Dr. Gafar Alawode (far left), HFG Nigeria. 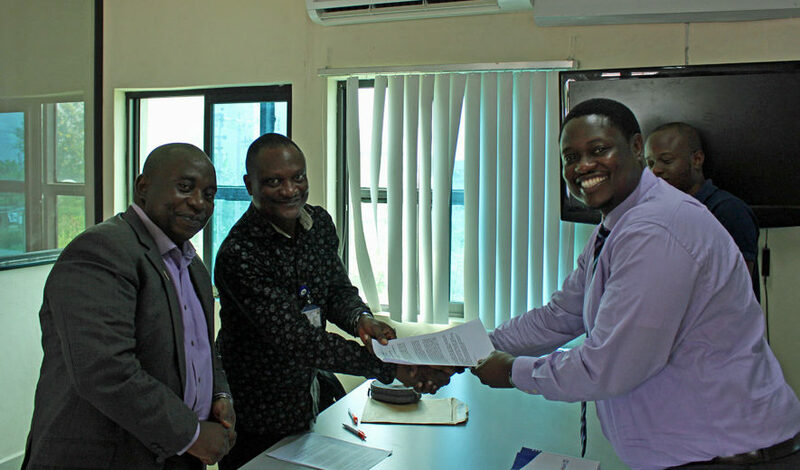 The MOU was signed at a small ceremony at the radio station in Port Harcourt, Rivers state. Mr. Stanley Wowo, of the Rivers state government and RIVSACA, and Mrs. Anne Anyaka, President of the Rotary Club of Port Harcourt, thanked Mr. Tomi Bolade and the management of Cool/Wazobia FM/Nigeria Info for their public commitment towards the reduction of HIV and AIDS. Mr. Bolade is the head of the station and a member of the DRM TWG. The Rivers State DRM TWG is making great progress, working with private sector bodies in new ways to generate more ownership and resources for the HIV and AIDS response.